We are all waiting on many things everyday.We wait on stop lights even if we speed up to them and have to stop and wait. Mothers have to wait nine months for their babies to be born. Then we wait for them to crawl, then wait for them to walk, and them grow up. The Bible tells us to “wait on the Lord and be of good courage, and he shall strentghen thine heart”. (Psalm 27:14). A good way to wait on the Lord is to be like the waiter who waits on others. “Bear ye one another’s burdens and so fulfill the law of Christ” ( Galatians 6:2). In other words stay busy, while your waiting. All of life is about waiting. It doesn’t do any good to be anxious. “But let patience have her perfect work that ye may be perfect and entire wanting nothing.” (James 1:4). So get over it, and stay busy, by waiting on the Lord and others. A waiter is a servant. “The whole creation groaneth and travaileth in pain. ” (Romans 8:22a). We are all waiting for Jesus to return, and straighten this world out ! God is hardly ever in a hurry. One of the hardest lessons that we will ever have to learn is to wait. Real Men Love Jesus ! Real Men act like Jesus, or at least try too. Real Men talk and live like Jesus. Want to be a Macho man? Want to be Cool? Want to be strong and Smart? Then ask Jesus Christ, The Only Begotten Son of God into your heart and follow him ! How do you do that? Read the Gospels, Matthew, Mark, Luke and John, they tell the way. Jesus’s way is the only way, to Love, Happiness, Joy, Peace,Power, Strength, and Success! “This book of the law shall not depart out of thy mouth; but thou shalt meditate therein day and night, that thou mayest observe to do according to all that is written therein: for then thou shalt make thy way prosperous, and then thou shalt have good success.”(Joshua 1:8). May we be more like you Jesus, today and every day. Girls, want to be Real Women? Be like Jesus and the Holy Spirit ! “Who can find a virtuous woman? for her price is far above rubies. The heart of her husband doth safely trust in her, so that he shall have no need of spoil. She will do him good and not evil all the days of her life. She seeketh wool, and flax, and worketh willingly with her hands.She is like the merchants’ ships; she bringeth her food from afar. She riseth also while it is yet night, and giveth meat to her household, and a portion to her maidens. She considereth a field, and buyeth it: with the fruit of her hands she planteth a vineyard. She girdeth her loins with strength, and strengtheneth her arms. She perceiveth that her merchandise is good: her candle goeth not out by night. She layeth her hands to the spindle, and her hands hold the distaff. She stretcheth out her hand to the poor; yea, she reacheth forth her hands to the needy. She is not afraid of the snow for her household: for all her household are clothed with scarlet. She maketh herself coverings of tapestry; her clothing is silk and purple. Her husband is known in the gates, when he sitteth among the elders of the land. She maketh fine linen, and selleth it; and delivereth girdles unto the merchant. Strength and honour are her clothing; and she shall rejoice in time to come. She openeth her mouth with wisdom; and in her tongue is the law of kindness. She looketh well to the ways of her household, and eateth not the bread of idleness. Her children arise up, and call her blessed; her husband also, and he praiseth her. Many daughters have done virtuously, but thou excellest them all. Favour is deceitful, and beauty is vain: but a woman that feareth the Lord, she shall be praised. Give her of the fruit of her hands; and let her own works praise her in the gates.” (Proverbs 31:10-31). I can’t think of anything that would make God angrier than killing little babies except rejection of his Son Jesus Christ, whom he gave to die for the sins of the World. The Bible says, ” If they will not obey I will utterly pluck up and destroy that Nation saith the Lord.” Jeremiah 12:17. “The wicked shall be turned into Hell and all of the nations that forget God. “Psalm 9:17. “Now consider this ye that forget God, lest I tear you in pieces and there be none to deliver.” Psalm 50:22. Those that tear babies in pieces will also be torn in pieces. What horrible monsters. Their conscience is seared with a hot iron. They have hardened their hearts and will live in Hell for the rest of their miserable lives and when they die, they will go to Hell. What kind of a horrible Monster would kill a baby? There is only one hope for them, and that is to turn to Jesus Christ, and seek forgiveness. Jesus said: “And whoso shall receive one such little child in my name receiveth me. But whoso shall offend one of these little ones which believe in me, it were better for him that a millstone were hanged about his neck, and that he were drowned in the depth of the sea. Woe unto the world because of offences! for it must needs be that offences come; but woe to that man by whom the offence cometh! Even so it is not the will of your Father which is in heaven, that one of these little ones should perish.” ( Matthew 18). The Jews had their own favorite means of abortion which was their god molech a terrible large image of a beast that had a raging fire inside of its belly that the evil people would throw their babies into its mouth and burn them up. The Egyptians would throw their babies to the crocodiles. Next to rejection of Jesus Christ, abortion is Americas worst national sin in which millions upon millions have been slaughtered.The abortion monster devils, try and make it look all clean in a nice hospital setting, and call it a procedure. Well God is going to preform a procedure on them. Jesus said “Let the little children come unto me and forbid them not for of such is the kingdom of Heaven, Don’t kill babies There are people who want to adopt. How to best use this web site. As you will notice on the right side of this page you can find Categories. Please choose and click on from this list a topic you are interested in, and see all the teachings in that category of what you want to read at any time you visit this site. We hope you will send us your comments and questions. May the Lord Bless you. 6 Take heed that ye do not your alms before men, to be seen of them: otherwise ye have no reward of your Father which is in heaven. 2 Therefore when thou doest thine alms, do not sound a trumpet before thee, as the hypocrites do in the synagogues and in the streets, that they may have glory of men. Verily I say unto you, They have their reward. 3 But when thou doest alms, let not thy left hand know what thy right hand doeth: 4 that thine alms may be in secret: and thy Father which seeth in secret himself shall reward thee openly. 24 No man can serve two masters: for either he will hate the one, and love the other; or else he will hold to the one, and despise the other. Ye cannot serve God and mammon.25 Therefore I say unto you, Take no thought for your life, what ye shall eat, or what ye shall drink; nor yet for your body, what ye shall put on. Is not the life more than meat, and the body than raiment? 26 Behold the fowls of the air: for they sow not, neither do they reap, nor gather into barns; yet your heavenly Father feedeth them. Are ye not much better than they? 27 Which of you by taking thought can add one cubit unto his stature? 28 And why take ye thought for raiment? Consider the lilies of the field, how they grow; they toil not, neither do they spin: 29 and yet I say unto you, That even Solomon in all his glory was not arrayed like one of these. 30 Wherefore, if God so clothe the grass of the field, which to day is, and tomorrow is cast into the oven, shall he not much more clothe you, O ye of little faith? 31 Therefore take no thought, saying, What shall we eat? or, What shall we drink? or, Wherewithal shall we be clothed? 32 (For after all these things do the Gentiles seek:) for your heavenly Father knoweth that ye have need of all these things. 33 But seek ye first the kingdom of God, and his righteousness; and all these things shall be added unto you. 34 Take therefore no thought for the morrow: for the morrow shall take thought for the things of itself. Sufficient unto the day is the evil thereof. 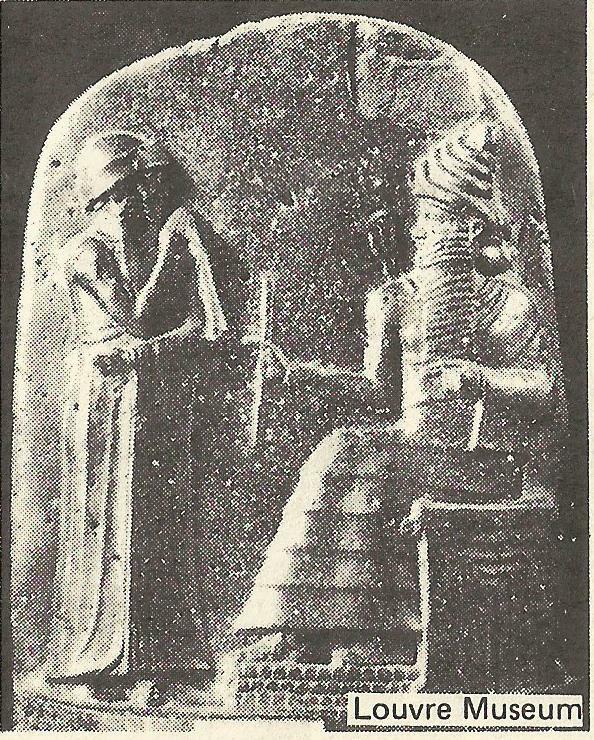 Shown here is Hammurabi before the sun god Shamash. This relief is found at the top of the stone. 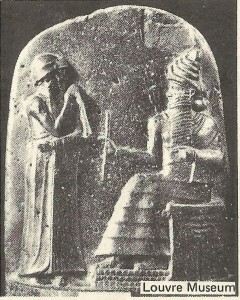 Hammurabi was a famous king that lived at the same time as Abraham. This king of the city of Babylon became very powerful and is remembered for writing down some laws and codes for the people to live by. The code is written out on a stone 8 feet long and 2 feet wide and has about 4000 lines of text. The city of Ur during Abraham’s time had a huge temple in it that was built after the pattern of the Tower of Babel. 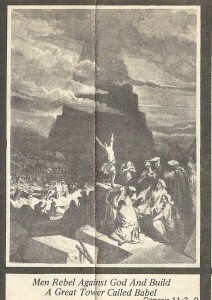 At this temple the people worshiped the moon god, Sin, and his wife, Ningal ( also known as Ishtar, and Nina after which the city of Nineveh was named). She was the goddess of sexual passion, and all of her temples had special rooms where her male worshipers would make love to the priestesses. Also it was required that the maids, and widows, and wives in the Babylonian Kingdom of those days offer their services in the temple at least once in their lives. Certainly, Abraham and his beautiful wife Sarah, living in Ur did not go unnoticed by the official religious system of their day and most certainly were called upon to attend the services However, it did not seem to be the sexual practices of the people that offended Abraham seeing how he was so disposed himself to let others court his wife as though she were his sister, but rather it was the fact that the people did not worship the true God. IT IS YOUR CHOICE, WHO DO YOU PUT YOUR TRUST IN ??? If you click on this link below it will take you to the CENTER OF THE BIBLE. Please share this with others. Gods word is powerful, and prayer is powerful.